HBO's Bill Maher spouted his usual anti-conservative and anti-Fox News rhetoric on Monday's Situation Room on CNN, attacking the Tea Party movement as "teabaggers [who] are all carrying the banner...of corporatist America" and accusing CNN's competitor of "filling people with misinformation." Maher also labeled Republican voters "far right" and a "fringe group of people who are very forceful." The left-wing HBO host appeared for two segments starting at the bottom of the 5 pm Eastern hour. Anchor Wolf Blitzer began with an election-related question: "Let's talk a little bit about what's going to happen tomorrow. A lot of Democrats are worried. They're sitting on a potential political disaster tomorrow. Here's the question to you: why? What happened?" Maher actually first blamed the Democrats: "Well- I mean, partly, it is the Democrats' fault. They don't do very good at bragging about their achievements. This Congress, which I'm sure is going to be tarred as a do-nothing Congress, actually was one of the more successful congresses in recent memory, probably not since Lyndon Johnson in 1965 has a Congress achieved so much." The guest predictably cited health care "reform" and financial reforms as his examples. MAHER: Well, that's part of it. Also, it's- part of the problem, of course, is your competitor over there at Fox News, filling people with misinformation. Somehow, people have not gotten the message, for example, that Obama gave you a tax cut. All they hear is that the stimulus bill was some sort of socialist program to run up the debt. Almost half the stimulus program was tax cuts, and people just don't seem to be able to get this information in their head. BLITZER: But he's such a good communicator- the President. BLITZER: I said the President- you know, got into office because he's such a powerful communicator and he delivered a message that clearly resonated back in 2008. MAHER: Well, he seems to have forgotten some of those communication skills. That's true. We cannot blame it all on Fox News. He should have been out there more telling people, bragging about what he and his administration and the Democratic Congress have done for them. They did things that actually made their lives better- health care, credit card reform, things like this. The banks can't get in the middle now if you get a student loan. That's $90 billion that was saved. You know, you can kind of go on and on down the list of the way people's lives are practically made better by a Democratic government that actually fights for people, as opposed to corporations. But somehow, that idea doesn't carry the day. The teabaggers are all carrying the banner, really, of corporatist America. We talked about it on our show Friday. Somehow, their agenda, as a populist organization, is the exact same agenda as billionaires like Steve Forbes. BLITZER: Some on the left think the President went too far towards Wall Street- didn't go far enough towards the- what we call these progressive ideas- ideas that you like. Are you among them who thinks (sic) the President wasn't progressive enough? MAHER: Oh, absolutely- and, by the way, when we define 'progressive,' please remember that we're defining that by the parameters of 2010, when actually, what is centrist today- really, if you look at- like 1994, when Bob Dole presented his health care plan- okay, that I assume was considered a centrist plan, or maybe even a little to the right, since it was Bob Dole, the leader of the Republican party. That's essentially the health care plan that we got in 2010 from the Obama administration. But somehow, that became socialism. Near the end of the first segment, the CNN anchor asked his guest about O'Donnell. Not only did he insult the Republican candidate (Maher actually claimed at one point that he liked O'Donnell), but launched another attack on the "teabaggers:"
BLITZER: Let's talk a little bit about Christine O'Donnell, a woman you helped make rather famous on 'Real-Time with Bill Maher.' She's way down in the polls in Delaware, as you probably know. If she doesn't win tomorrow, what do you think is next for her? You've known her a lot longer than we have. BLITZER: Because a lot of people think she might have a future- she might have a future as a TV pundit out there. I wouldn't be surprised if she signs with Fox or some other network. Would you be surprised? BLITZER: She did beat Mike Castle- congressman, former governor of Delaware, someone who had been elected and elected numerous times in the state- in a Republican primary. She obviously had something going for her with these Republican voters out there. 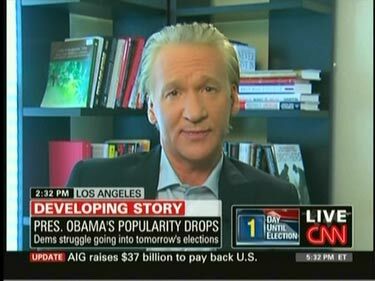 MAHER: Yes, Republican voters, which is basically the far right. It's a fringe group of people who are very forceful, even though they don't have a lot of numbers, because they have enthusiasm. But let's not forget that people like Christine O'Donnell- and there's going to be a lot of these teabaggers who are sweeping into the country- into the state houses, into the Congress, rather, next year- and somehow, they sell us on the idea that because they haven't been to Washington before, they're pure and that they will come into town and change the culture. That's not going to happen. They're not pure. They're just more naive. They're not going to change the way business is done in Washington or change human nature. Deals are still going to be made the way they've always been made, and these people will just have to catch up. Just within the past month, Maher has labeled Republicans a "deadly enemy," compared Tea Party activists to Nazis, and used the Brett Favre sexting scandal to bash Sarah Palin and other conservative women, as well as white men.